The concept of the IoT is about adopting the internet in almost all economic activities, and it focuses on the technology backend for cross category connectivity and interoperability. The Industrial IoT (IIoT) refers to heavy industries such as manufacturing, energy, oil and gas, and agriculture in which industrial assets are connected to the internet. Different segments are more industrial than others, and connected industry, which specifically focuses on manufacturing, is on the most industrial side of the spectrum, as shown in Figure 1. Connected industry is the largest segment within IoT, comprising more than 30% of the market in 2017. It overlaps with the overall I4.0 market, however I4.0 has a broader scope, as it aims to optimise the entire manufacturing value chain and includes other supporting technologies such as additive manufacturing, augmented and virtual reality, and collaborative robotics. 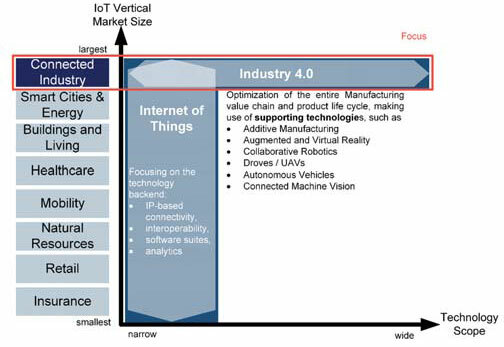 Figure 2 illustrates the overlap of I4.0 with IoT and highlights the other I4.0 supporting technologies. 2. Disrupted technologies: The technologies and standards (such as the traditional five-layer automation pyramid) which will be altered or replaced by I4.0 technologies. 3. Supporting technologies: Technologies that are not part of the IIoT stack but are frequently deployed alongside IIoT technologies and support the I4.0 key use cases. 4. Key use cases: Use cases implementing IIoT and supporting technologies to improve operations, realize new revenues, and better serve customers. 5. Disrupted stakeholders: Original equipment manufacturers (OEMs) factories, and industrial automation suppliers are all using I4.0 technologies to differentiate themselves in the market. Major industrial automation players like Siemens, Rockwell Automation, General Electric, ABB and Schneider Electric are creating strategies built around IIoT and I4.0, while forward thinking factories and OEMs are using I4.0 technologies to improve operations and create differentiated products and services. The addressable market for I4.0 can be thought of as the market for the building blocks that comprise the connected industry subset of IoT plus the market for I4.0 supporting technologies. These technologies enable the numerous Industry 4.0 use cases, ten of which are highlighted in Figure 4. Using the above definition for I4.0, the overall market is currently estimated at US$65bn and is expected to reach US$338bn by 2023, with a CAGR of 39% (see Figure 5). 1. Efficiency gains across the whole organisation: Many industrial organisations have estimated productivity gains from investments in I4.0 technologies to be ~25%. Fanuc and Cisco recently partnered to create an IIoT enabled predictive maintenance platform that is improving customers’ overall equipment efficiencies (OEE) by eliminating unplanned downtime. One Fanuc customer saved an estimated US$40m in downtime using this connected platform. 2. New revenue streams: OEMs are using IIoT technology to create new x-as-a-service business models. These pay-per-outcome business models better align OEMs with customers’ objectives by incentivising OEMs to make sure their machines are operating properly. Machine tool OEM Heller uses the Siemens MindSphere platform to allow customers to pay for machine usage by the hour. OEM Kaeser Compressors takes this model even further, allowing its customers to pay for compressed air by the cubic metre. 3. More flexible, customer centric operations that reduce time-to-market: I4.0 technologies enable manufacturers to be more flexible in all stages of the product development lifecycle. Engineers at Volvo Construction Equipment recently adopted 3D printing technology to help with rapid prototyping of new parts. By using 3D printing instead of traditional tooling methods, Volvo was able to cut both the development time and cost per part by 90%. The five-layered technology architecture, which has established itself over the last 50+ years, is one of the core elements likely to be disrupted through Industry 4.0. The pyramid is the result of the decades-long convergence of information technology (IT) and operational technology (OT) and is widely accepted as the standard high-level architecture in manufacturing environments. The term OT is usually used for computer processing technology in the physical world of manufacturing technology, including programmable logic controller (PLC), distributed control system (DCS) and supervisory control and data acquisition (SCADA). These technologies have been used in isolated vertical applications and have been controlled locally with the help of proprietary protocols. IT on the other hand has been deployed in administration and management, for example coming in the form of enterprise resource planning (ERP), customer relationship management (CRM) or manufacturing execution systems (MES). An IDC survey conducted in 2015 study found that 66% of manufacturing companies use public clouds and 68% use private clouds for hosting applications. While IT operations is still the primary benefactor of cloud infrastructure, new technology promises to solve many of these technical constraints that have been holding back cloud adoption of more OT-oriented applications, such as MES and SCADA. Many SCADA and MES suppliers are leveraging these new technologies and offering cloud-based solutions in addition to their traditional on-premise solutions. IIoT platform providers like Microsoft and Amazon are well positioned to benefit from this transition to move applications to cloud, due in large part to their ability to provide both Infrastructure-as-a-Service (IaaS) and IoT Platform-as-a-Service (PaaS). 1. Application + Infrastructure-as-a-Service (App + IaaS): Standalone applications running on virtual machines hosted in the cloud. 2. Application built on a Platform-as-a-Service (App + PaaS): Applications built on top of and tightly coupled with a particular IoT cloud platform-as-a-service provider like Azure IoT or AWS IoT. 3. Software-as-a-Service (SaaS): Multi-tenant, end-to-end, cloud applications that are not built on top of a PaaS and are hosted on either leased or owned IT infrastructure. Microsoft and Amazon are the leading providers for Infrastructure-as-a-Service with 13% and 33% of the market share respectively. Not surprisingly, the latest IoT Analytics IoT Platforms Report found that both Microsoft and Amazon were also leaders in the IoT platform space, although Microsoft had a narrow lead over Amazon (29% vs. 28%). Microsoft’s history with industrial automation companies dates back to the create of the open platform communications (OPC) industrial communications standard, which at the time of its invention in early 1990s required a Windows 3.0 operating system. The impressive roster of industrial automation companies that have partnered with Microsoft Azure to host their IIoT platforms is a testament to Microsoft’s ability to use its existing relationships with industrial automation companies. Azure seems to be emerging as the infrastructure of choice for IIoT end users and industrial automation providers alike. JD Norman Industries, a leading manufacturer of formed, machined and cast metal parts, enlisted cloud ERP/MES provider Plex to provide an integrated ERP/MES solution that scales with the company as it grows. JD Norman’s growth strategy involves acquiring a number of international companies, so having a scalable, cloud-based MES/ERP system enables them to quickly integrate new plants with their existing systems. By utilising the highly scalable SaaS model that Plex provides, JD Norman avoids having to install and manage on-premise MES solutions in factories across the globe. PLEX partner Kors provides the systems integration and machine connectivity portion of the solution, enabling JD Norman to collect and analyse performance data within the cloud-based PLEX platform. Industry 4.0 is about manufacturers using IIoT and other supporting technologies like additive manufacturing and augmented reality to improve operations. The market for these technologies is primed for rapid growth due to the dramatic operational improvements and competitive advantages that a number of early I4.0 adopters have already realised. New technologies, like machine-to-cloud integrations, are disrupting existing industries and making it easier for manufacturers of all sizes to connect to the internet and realize the vision of I4.0. Report about Industry 4.0 & Smart Manufacturing you find here. Will eCall drive rapid market growth in automotive M2M communications?